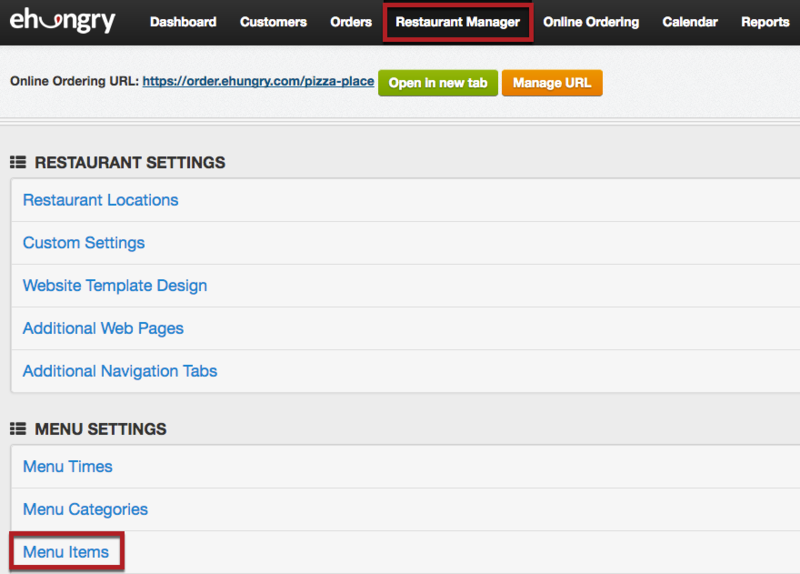 In your Online Ordering Console, you can edit a menu item by selecting "Restaurant Manager" from the main menu, and then selecting "Menu Items" under the "MENU SETTINGS" heading. Find the menu item you want to edit and click the Notepad/pencil Icon. Here you can change anything you need about the item, such as description, name, price & image. We will now go though some common changes! Here you can change or select additional categories for your selected item. Note: if no category is selected it will not be displayed for customers to order. Enter updated and new prices and price names here. You can also select Yes next to "Item only has a single price..." and enter only a Price Value. Upload a file or enter an image URL here. You can also delete the current image. Note: The image should be 600 pixels or less on either side for faster downloading. Large images will cause your pages to load very slowly for your customers. Be sure to click Save This Information at the bottom when you are done!